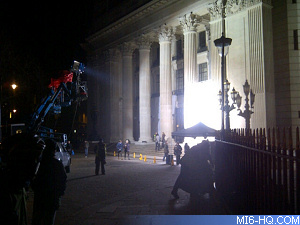 As reported yesterday, the new James Bond film "Skyfall" was shooting at Trinity Square in East London. The impressive building was surrounded in unmissable white screens and 50 kilowatt lights. Those bulbs were put to good use last night as the cast filmed scenes at the front of the building at night. The building itself, now high-class apartments, used to house the London Port Authority in the eighteenth century. The LPA designed this grand building by tendering the project to a few aspiring architects and received 170 submissions. The winning design, by Edwin Cooper in a Beaux Arts style, has been preserved and restored to the best of today's ability. Click here to view the gallery from the daytime set up. According to the Twitterverse, the "Skyfall" crew will also be filming a restaurant scene in the Old Naval College, Greenwich.